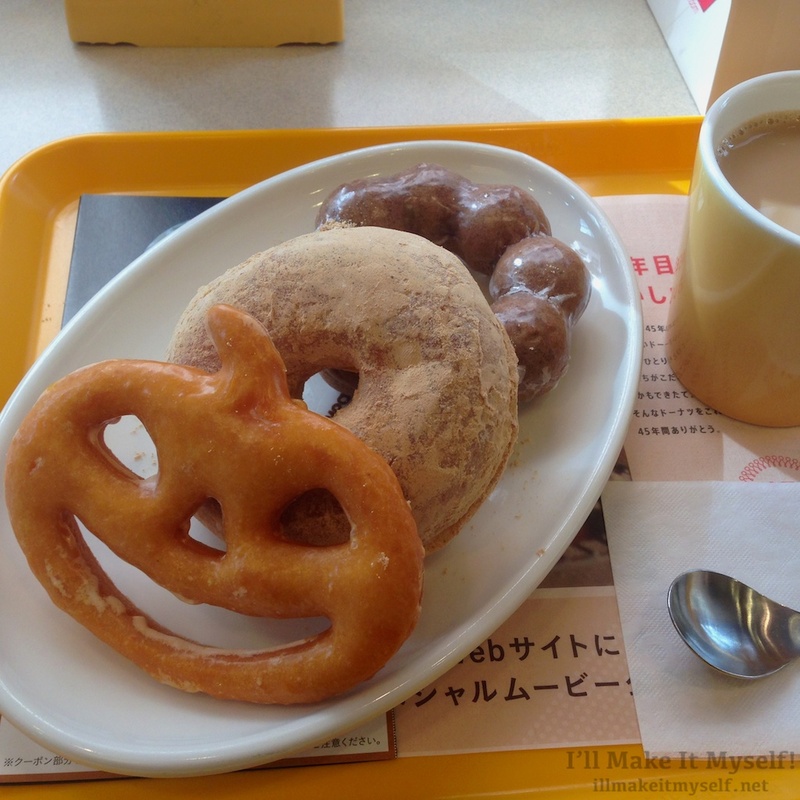 Halloween Food in Japan (2015): Mister Donut Pon de Shu – I'll Make It Myself! Both Mister Donut and Krispy Kreme Japan are doing Halloween campaigns this year (see 2012, 2013, 2014), and because I love you all so much, I ate a ridiculous amount of doughnuts one morning for science. What happened with Mister Donut was that I wanted to eat all the Halloween ones, but because they didn’t have most of them in stock in Ikebukuro, I tried to eat enough to get me through till lunch, BUT THEN on my way to a business meeting, my coworker and I arrived a little early and stopped at Krispy Kreme, so I had yet another doughnut. The moral of the story: Krispy Kreme would have been a better choice for my doughnut blogging needs. It was outside the Krispy Kreme that I began to notice how pervasive Halloween has gotten in Japan’s major metropolitan areas. All the department stores are doing Halloween campaigns. All the bakeries are doing Halloween sweets (more on that in a future post). I saw someone carrying a frakking jack-o-lantern purse, for crying out loud. (Then I bought one in Kyoto. Fight me.) There are Halloween flyers in the department stores to show you where to buy costumes, sweets, and goods. There are Halloween events. I now own Halloween furoshiki. I don’t know what my life is anymore. I’m sorry, we were talking doughnuts, right? 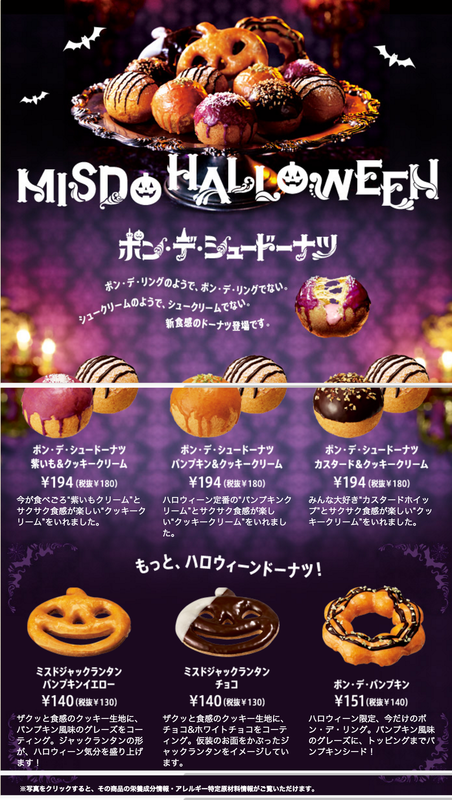 I wanted all the cool doughnuts from the website/ad, but all Ikebukuro had was the jack-o-lantern shaped ones. I also got a kinako raised ring (yeast doughnut) and a chocolate Pon de Ring. Pon De Shu (creme-filled) doughnuts in custard (“everyone loves custard!”) and cookies-and-cream. Pon de Pumpkin: Limited time doughnut for Halloween, has a pumpkin glaze and pumpkin-seed topping. I didn’t think the pumpkin flavor was that noticeable on the Jack-o-Lantern Pumpkin Yellow, and I want the pumpkin creme and the pon-de-pumpkin! Next time: Krispy Kreme yields better results. Pingback: Halloween in Japan (2015): Krispy Kreme’s “Mad for Monsters” Campaign | I'll Make It Myself! Pingback: Halloween Food in Japan: Family Mart | I'll Make It Myself!